The pictures above are of a typical water meter. 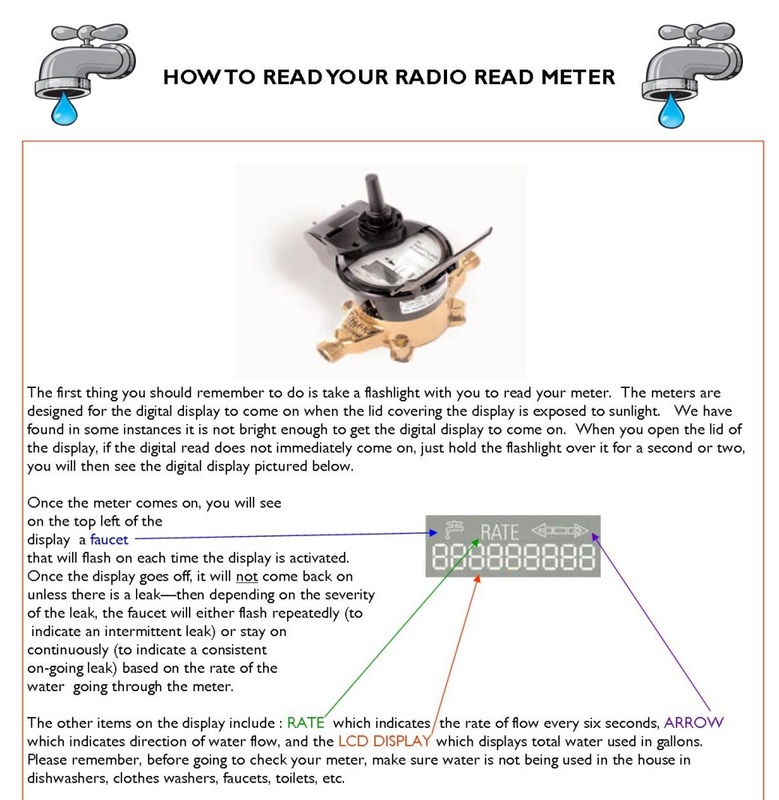 The important information is all listed or shown on the face of the meter. There are two main types of meters, CUBIC FOOT and GALLON. The meter above is clearly labled a CUBIC FOOT meter. One full turn of the red dial is one hundreth of a cubic foot, (.01cf) in the picture the furthest right 5 is the hundreth spot. The 3 to the left is in the tenths of a cubic foot, (.1cf). The next 2 is cubic foot. The next five to the left is ten cf, then hundred cf, thousand cf and so on. The way to convert cubic feet to gallons is really quite simple. There are 7.48 gallons per cubic foot, so simply multiply cubic feet times 7.48 and you will have gallons. Most Cities, Water Districts or Water Providers bill in "UNITS". If your meter is a cubic foot meter, one unit is equal to one hundred cubic feet or 748 gallons. If you check your bill and it states 15 units of usage this would indicate usage of 11,220 gallons. Since the other type of meter is a gallon meter, Cities, Water Districts, and Providers will call a unit 1,000 gallons. Current Read" would be 343. The reason for this is the City is only concerned with full "units", as a unit is 100 cubic feet the meter is only read to the one hundred slot. A meter check is easily performed knowing your previous read. If the previous read was 321 you have used 22 units. Generally the City will also put the date of the read on your bill. Knowing this information you can easily track your usage from day to day. What If You Have a Well System? The simplest and most commom way to determine if you have a leak in your well system is to check and see if your pump is cycling with no water running. To do this simply check in your pump room/house when no water is on then wait to see if your pump starts. You should be able to hear your pump if you are near the well itself. If the pump is running with no water on you likely have a leak. The next thing you can do is to check your pressure gauge. Note the pressure, usually between 45 and 65 psi. 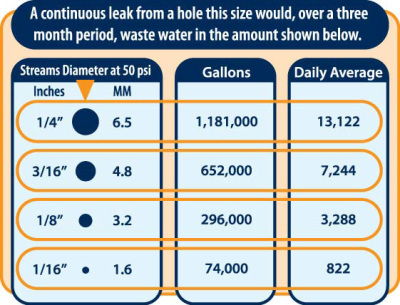 If the pressure is going away with no water on you likely have a leak. If you have an unusually high electric bill for no apparent reason, this may be due to your well pump running excessivly trying to maintain pressure in a system that is leaking. Leaks are a very curious fact of life. Many things contribute to leaks and the causes of leaks. First and foremost is the understanding that leaks generally occur by no fault other than a fault in the earth's plate. As the earth is always moving and a somewhat rigid pipe is buried in the earth this eventually causes any weak spot in the pipe to begin to leak. Weak spots are for the most part fittings in the pipe, however, old metal pipe has weak spots in the pipe itself. Those awesome trees and shrubs you have in your yard are a major culprit in causing leaks. The roots of a tree can "sense" water in a water line and will grow to the waterline. When I was a municipal water works operator a leak occured on a 4 inch main line approximatley 50 feet from where a contractor was removing a tree that was not more then 10 inches in diameter. The cause of the leak? One of the main "tap" roots had coiled around the pipe like a boa constrictor, causing the pipe to rupture when the tree was pulled out using an excavator. Rarely a leak can be caused by heavy truck traffic or a large piece of equipment driven over the line. Another cause of leaks is know as a "water hammer", this will be explained below. A water hammer is a surge of water caused by opening or closing a main valve too quickly.The best description I have is when you are using your kitchen faucet sprayer and you release or let go of the sprayer. There is a thud and your sprayer hose jumps or vibrates. This is a small version of a water hammer. If this is done on a larger scale like turning off and then on your water meter when your line is empty the water hammer will cause a surge of up to three times your water pressure. So if you have 50 psi it will/could create 150 psi and damage your pipes. In the days of yesteryear it was thought that you should open a faucet when your water was turned off. This is only applicable if you have a leak and plan on turning your valve back on rapidly rather than gradually. When your water is turned back on it should be done very slowly to ensure no hammer happens.This can be done by listening to your valve when the water is turned back on. You will hear the line fill. Once the line is full the valve can be opened fully.